I hadn’t had one of these since I was much younger – I bought them for my kids recently and they love them. Yesterday I was peckish and had one and yummy! Crunchy, sweet and so moreish. Have put on my shopping list to get more! Much loved favourite used to have these all the time its a great healthy snack with sesame seeds, great flavour, great crunch and tastes absolutely delicious loved these and still do. I love the taste, the crunch and they are so delicious. I always have a Golden Days Sesame Snap packet in the car, for everyone to enjoy. My energy staple go to! It has been a long time since i had these – probably my school days. They are quite tasty, a little sweet, but also a little savoury – from the sesame seed? I’d recommend these. Golden Days sesame snaps are a lovely snack yo have in your handbag,l like to eat them in a work break as they are easy and not messy! These are the bees knees. Crunch and sesame seed and sweetness. Perfect combination. I munch away on these watching a good movie. Still taste the same as when I was a kid. Good stuff. Golden Days Sesame Snap bars can always be found in my handbag. Love the taste of these sesame bars and such a handy a good little snack when the hunger hits. These are a great snack to have. They come in a pack of 3 and I think you can buy them individually too. They are a little bit similar to a brittle but with sesame seeds instead of nuts. Lovely with a cuppa or a quick snack on the go. 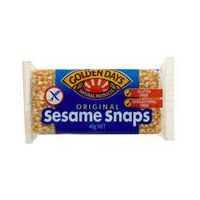 How would you rate Golden Days Bars Sesame Snaps?